The 2017 INSA Achievement Awards recipients will be honored at a reception and awards ceremony on Feb. 23, 2017, at the United States Institute of Peace. Defense Intelligence Agency Director Lt. Gen. Vincent R. Stewart, USMC, will provide the keynote address. Photo credit INSA. The Intelligence and National Security Alliance (INSA) announced Jan. 25 the recipients of the 2017 INSA Achievement Awards. The awards recognize outstanding mid-level professionals from government, military, private sector and academia supporting the U.S. national security mission. 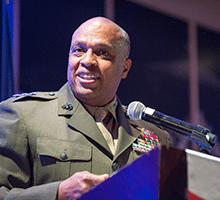 The 2017 Achievement Awards ceremony and reception will take place Feb. 23 at the United States Institute of Peace in Washington, D.C. Defense Intelligence Agency Director Lt. Gen. Vincent Stewart, USMC, will give the keynote address. The INSA Board of Directors established the Achievement Awards in 2010. Each award is named after a recipient of the William Oliver Baker Award, which INSA presents annually to an individual for their sustained contributions to U.S. intelligence and national security affairs.